Day of the Outlaw isn’t a picture I recommend because I particularly enjoyed it: it’s just too bleak and mean to be likable. 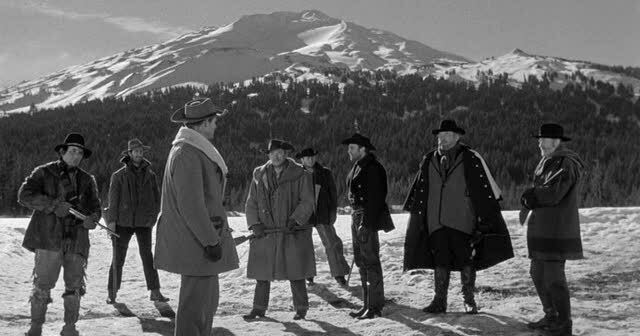 But I found the 1959 film fairly intriguing, courtesy of its offbeat cast, unexpected twists and especially its setting: the Oregon high country around Mt.Bachelor, in the dead of winter. A gang of renegades descend on an isolated town, and their threat pairs with other tensions among the towns inhabitants. Robert Ryan heads the home team, and he does his usual pro work—Ryan was quite busy from 1957-59, starring in five films and fourteen television episodes. His co-star from the previous years Gods Little Acre, Tina Louise, is the female lead: like Ryan, the beauteous redhead was on view a lot in the late 50s, but her bid for serious roles slowed to a crawl when she signed onto that ‘3-hour tour’ in 1964. She’s okay here. Publicity shot that has nothing to do with the story. Leading the bad guys is Burl Ives, fresh off his one-two punch of Cat on a Hot Tin Roof and The Big Country (which netted him an Oscar). Ives is restrained, the fireworks from his earlier roles not on view. Also on board is David Nelson, competing with his brother Ricky who shot it out that same year in Rio Bravo. David does okay, but everybody went to see brother Rick and ‘Rio’—they stayed away from this little black & white offering, and it was buried for many years from TV showings. I thought I’d seen ’em all, yet didn’t catch this movie until five decades after it was released. Also with Nehemiah Persoff and Elisha Cook. Buffs will recognize Jack Lambert, Frank de Kova, Dabbs Greer and William Schallert. Andre de Toth directed; Russell Harlan handled the camera, getting a good deal of cold, claustrophobic drama out of the snowy settings. 92 minutes that pulled in $2,360,000. Mt.Bachelor, Oregon makes a good backdrop.